RALEIGH – The Civil War savaged lives yet secured the future of generations in North Carolina and the rest of the nation, and altered the course of American history. The fight for liberation is just one of many moving features of the “Freedom, Sacrifice, Memory: Civil War Sesquicentennial Photography Exhibit,” (www.nccivilwar150.com) which will visit the King Public Library from July 2-29 and the Harnett County Public Library in Lillington from July 5-29. The exhibit will commemorate the bravery and resiliency of North Carolinians throughout the Civil War with stimulating images gathered from the State Archives (www.archives.ncdcr.gov), the N.C. Museum of History (www.ncmuseumofhistory.org), and State Historic Sites (www.nchistoricsites.org). A total of 24 images will be displayed by the N.C. Department of Culture Resources (www.ncculture.com) in 50 libraries throughout the state from April 2011 through May 2013. A notebook will accompany the exhibit with further info rmation and also seeking viewer comments. North Carolina sent more troops to the war than any other Confederate state. The Tar Heel state also suffered the greatest losses at Gettysburg , Pa. , where one in four of Confederates who died was from North Carolina . The North Carolina Monument at Gettysburg was dedicated on July 3, 1929, to honor the 14,147 men North Carolina contributed to the Army of Northern Virginia. For info rmation on the exhibit call the King Public Library at (336) 983-3868 or the Harnett County Public Library at (910) 893-3446. For tour info rmation, call (919) 807-7389. 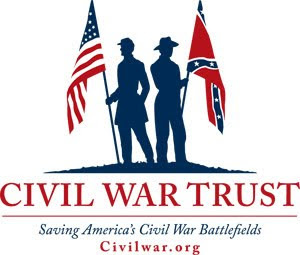 The North Carolina Department of Cultural Resources offers an aid to help kids – and parents – understand history with its “2nd Saturdays” program, as a number of State Historic Sites will feature the Civil War at events on July 9. 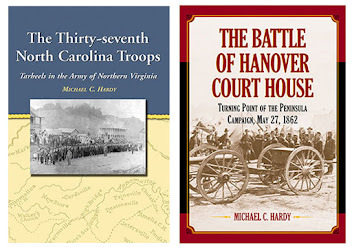 This year marks the beginning of the Sesquicentennial observance (www.nccivilwar150.com). The 2nd Saturdays program showcases authentic North Carolina culture, heritage and arts at the 37 museums and State Historic Sites administered by the N.C. Department of Cultural Resources (www.ncculture.com). Additional support for 2nd Saturdays comes from “Our State” magazine. “2nd Saturdays: Navigate. Battleship 101 and Demonstrate.” The Blue and Gray Navies Two North Carolinas – From Wood and Sail to Iron and Steam. Ship volunteers stationed throughout the ship engage visitors in specific subjects and areas including: gunnery, radar, sickbay, galley, engineering, and daily shipboard life. Free with Battleship admission. Come navigate this one-of-a-kind North Carolina artifact. For more information call (910) 251-5797. 10 a.m. to 4 p.m.
“2nd Saturdays: 19th Century Fashion.” Members of the civilian re-enacting group, The Carolina Citizens, will give a presentation on clothing and fashion on the Civil War home front at 11 a.m. and 2 p.m. in the Visitor Center . Author Deanna Klingel (www.booksbydeanna.com) will discuss her new book, “Avery’s Battlefield,” and sign copies from 10 a.m.-2 p.m.; it is one of a young adult series about the Civil War being published during the sesquicentennial observance about Avery Junior Bennett and his hound dog, Gunner, in Virginia from 1861 to1865. Author McKendree Long (www.mckendreelong.com) will hold a book signing for “No Good Like It Is,” the fictional account of two soldiers who rode with Terry’s Texas Rangers, a unit that fought at Bentonville. For more info rmation call (910) 594-0789. 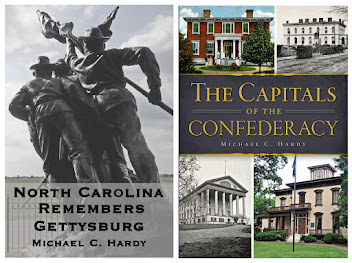 10 a.m. to 2 p.m.
“2nd Saturdays: After Appomattox -- N.C. Civil War Monuments 1865-1965.” The “2nd Saturdays” for July will focus on a lecture given by Doug Butler about his exhibit of photographs of N.C. Civil War Monuments. 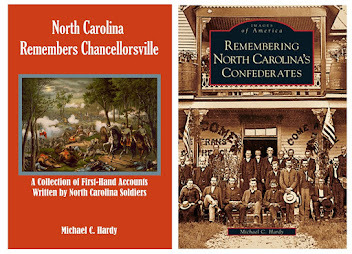 Learn how N.C. remembered what and who it lost during the Civil War. For more info rmation call (252) 522-2091. 11 a.m. to 2 p.m.
“Exploring Local Literature: Recent Works of Fort Fisher History.” Explore Fort Fisher ’s literary legacy with a look at some of the recent books on Fort Fisher history, both fiction and non-fiction. Authors will discuss their work and sign books in the visitor center. Special weapons firing, cannon demonstrations and costumed tours will take place throughout the day. For more information call the site at (910) 458-5538. 10 a.m. to 4 p.m.
“2nd Saturdays: Stagville Cinema -- ‘Gone With the Wind.’” The historic site will hold a free viewing of the American Civil War-era classic “Gone With the Wind,” with free popcorn. This will be followed by a contrast and comparison of Historic Stagville to Hollywood ’s interpretation of Southern plantation life. When this Academy-Award winning movie was released, it sold more tickets than any other film in history. For more info rmation call (919) 620-0120. The site opens at 9 a.m. (on regular schedule) but will stay open late for the movie showing from 7 to 11 p.m.
“2nd Saturdays: Blockade Runners and River Pilots.” See how the pilot s of Smithville became a vital link in the "lifeline of the Confederacy" by guiding blockade runners through the treacherous waters of the Cape Fear . Hear tales of the men who settled what would later become the city of Southport and see the tools of their trade in the “Pilots, Rescues, and Navigation” exhibit. Enjoy fun activities and crafts, costumed "visitors from the past" and special guests from the community. For more info rmation call (910) 457-0003. Noon to 4 p.m.
For more about the commemoration of the Sesquicentennial of the Civil War in North Carolina , go to www.nccivilwar150.com. Sorry that I’ve not had much time to post this week. Between recovering from last week, traveling this week, and more importantly, working on proofs, there has just not been a lot of time. 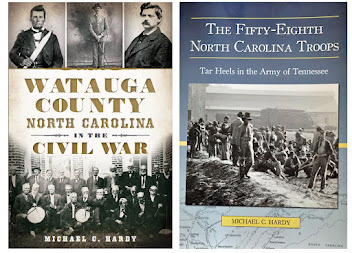 Yes, the proofs for North Carolina and the Civil War have arrived. It is a grueling process – fact checking, wishing that I had written something differently, wondering if I really wrote that… There are always little things found here and there. I found yesterday that I had the beginnings of the Bentonville Battlefield Park starting in the 1906s instead of the 1960s. All of this means is that I have had less time for blogging. This will change soon. Previously, I wrote about Round Table discussions. We’ve now set the date for the Yancey County program – it will be on October 13 at 6:30 pm at the Towncenter in Burnsville. We hope to see you there. A couple of other announcements – the Mitchell County Round Table will be on August 11 at the Spruce Pine Public Library at 6:30 pm. 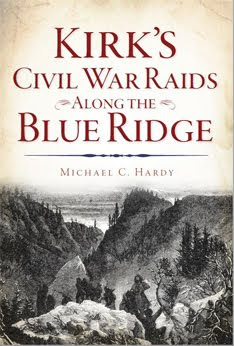 And, on August 27, at the public library in Boone, there will be a mini-symposium entitled Watauga County and the Civil War, with Matt Bumgarner, Chris Hartley, and me, Michael Hardy. I hope to see you out and about. And, if you would like to see some type of program about the War for Southern Independence in your county, drop me a line. I would love to help. On the road this week…. Well, I seem to be making up for all of my at-home days this past winter. I’ll be speaking tonight in Burnsville at the monthly meeting of the Col. John B. Palmer Camp, Sons of Confederate Veterans. They meet at the Burnsville Town Center at 6: 30 pm. Everyone is welcomed. 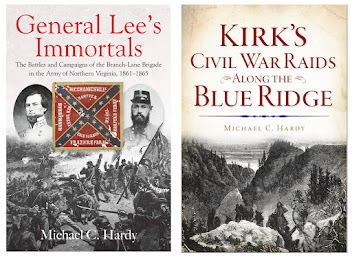 On Thursday, June 23, I’ll be speaking at the Lt. Gen. D. H. Hill Camp Sons of Confederate Veterans near Mooresville, NC. They meet at 6:00 pm at the Tally House in Troutman. And then this Saturday, I’ll be speaking around lunch time at the Elijah Norris family reunion in Boone. Norris served in the 58th North Carolina Troops, and I am looking forward to meeting and reconnecting with some of his descendants. I just wanted to take a few minutes to give you a recap of last night’s Avery County and the Civil War program. I call these “round tables” because that seems to be the best fit. We had 30 people present last evening, and the conversation lasted 2 ½ hours. In these programs, I typically start off with a short (five minutes?) introduction. I then sit down (the chairs are placed in a large circle). For the first hour or so, the questions are usually geared toward me. But after that, more people warm up, and some quite lively conversation takes place among the participants. Last night was no exception. The conversation was great! Many of us were sharing information on men from the area, local skirmishes, and the war in western North Carolina as a whole. Overall it was a fantastic event! If your library, community center, school, or historical society would like to host one of these events (here in NC), drop me a line and we’ll chat. I would love to help facilitate this in your county. NEW BERN – Bernard George dons the blue wool uniform of a U.S. Colored Troops Civil War soldier for re-enactments at historic sites and other venues. June 19th has become an unofficial holiday for many African Americans. On that date in 1865 in Texas , supposedly the last slaves learned the Civil War was over and that they were free. George celebrates the role of African Americans in claiming their freedom every day. “We are always the most photographed group at re-enactments; it’s such a well-hidden story of U.S. Colored Troops and sailors during the Civil War,” he observes. George re-enacts as a member of the N.C. Colored Volunteers, a group recruited in New Bern and part of the First African Brigade. When not re-enacting he is a city planner for New Bern , local historian and community volunteer. As a member of the AAHC, he can help ensure that African American history and culture are appreciated across the state. The commission’s mission is to preserve, protect and promote North Carolina ’s African American arts, history and culture for all pe opl e. The 2011 Summer Teacher Institute at the N.C. Museum of History will focus use of primary sources to explore African American life and culture, and is being partially supported by the AAHC. For George, interest in this history was stoked years ago. Through oral history from his grandfather and father, George learned that his family was free and had come from the Tidewater Virginia area to New Bern about 300 years ago. Documents from the 1700s at the Craven County courthouse further substantiate this history, along with family records. He notes that free blacks in North Carolina were the thesis subject for the eminent historian, John Hope Franklin. As a Civil War re-enactor, George finds many adults do not know the story of blacks fighting for their freedom in the war and during Reconstruction. Blacks and whites are interested in finding out more at programs at state historic sites or other venues. He says African Americans are particularly drawn to the re-enactors, because most Civil War re-enactors are usually white. When visitors see the U.S. Colored Troops re-enactors, they go home and tell their family and friends and so educate others. So whether at a Juneteenth program in Jacksonville on June 18, or at the Martin Luther King, Jr. National Memorial dedication on Aug. 28 in Washington, D.C., George will be upholding the African American Heritage Commission ideal and his own, by protecting and promoting African American history for all people. On the road this week – tonight (June 14), I’ll be speaking and signing books for the Frazier Camp of the Sons of Confederate Veterans. They meet at the Women’s Club of High Point on Johnson Street. The program starts at 7:00 pm, and I am sure everyone is welcome. 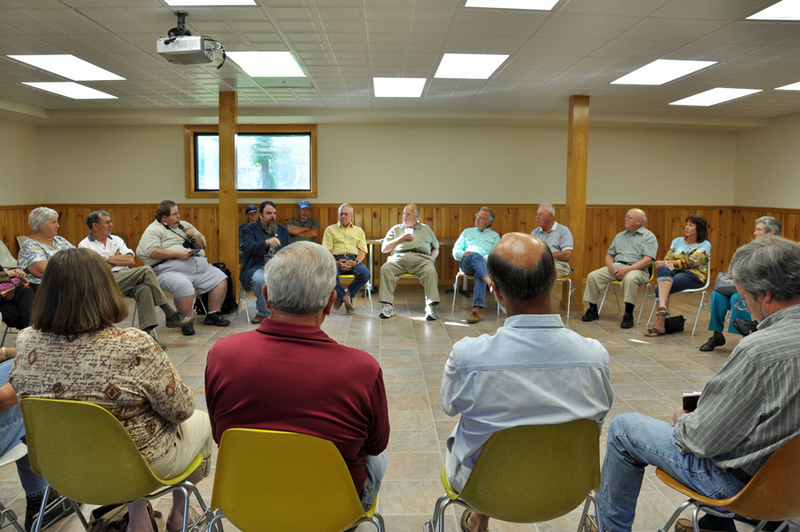 On Thursday, June 16, I’ll be leading the discussion at the Avery County and the Civil War Round Table. We’ll meet at the Avery-Morrison Public Library at 6:30 pm. Everyone is welcome, and the event is free. On Saturday, June 18, I’ll be speaking at the Douglasville Baptist Temple in Douglasville, Georgia. Dinner is at noon, and I’m scheduled to speak at 3:00 pm. The Confederate monument in Reidsville was the work of the Rockingham Chapter of the United Daughters of the Confederacy. According to sources, about 7,000 men, women, and children gathered on June 29, 1910, to unveil the monument. “The procession, which was a large one, was headed by a brass band of the city, carriages draped in Southern colors, the local military, Daughters of the Confederacy, and Junior and Children Chapters…. After the singing of “America,” Hon. H. R. Scott made a historical address, showing much research, and in conclusion presented the monument to the city in well-chosen words… Mayor Francis Womack accepted the handsome gift for the city, and Mr. E. R. Harris spoke the acceptance for the Scales-Boyd Camp. After the applause from the speeches subsided, Mrs. F. M. Williams, State President, assisted by Mrs. E. R. Harris and Mrs. G. L. Irvin, President and Vice President of the Rockingham Chapter, drew the cord, and the beautiful monument stood revealed. The rope used in the unveiling had been used at the monument at Gettysburg. Of course, as many of you know, on May 23, a Greensboro man hit the monument, knocking the soldier off and destroying him. The Rockingham City Council is presently looking into whether it will replace the monument, move the monument, or use this as a opportunity to totally erase the monument from the public sphere. And of course, the news media was quick to jump on the bandwagon. GoDanRiver.com ran a piece under the title: “History of Racism? Debate Continues in Reidsville” On reading this article, one would get the impression that the majority of people who attended the recent council meeting were against the statue being rebuilt. Another source I read (written by someone in attendance) stated that of the 35 people who spoke, 20 were in favor of rebuilding the statue, two were in favor of restoring it and moving it, and two were more concerned over tax payer’s dollars. So, that would leave six speakers not in favor of returning the statue. You will not get that sense of community support from the GoDanRiver article, which you can read here. My two cents worth? Put the monument back as it was, at the expense of the driver. It should be a crime to do otherwise. 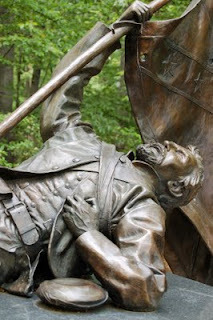 “True as the Steel of their Tried Blades: Heroes in Heart and Hand, They Fought Like Brave Men, Long and Well” – inscription Reidsville Confederate Monument. New research reveals surprising findings about the number of North Carolina soldiers who died during the Civil War. Josh Howard, Research Historian at the N.C. Office of Archives and History, has spent more than a year spearheading the North Carolina Civil War Death Study. The project has uncovered information that changes long-standing figures about the state’s losses. Virginia , South Carolina and Ohio are conducting similar research. 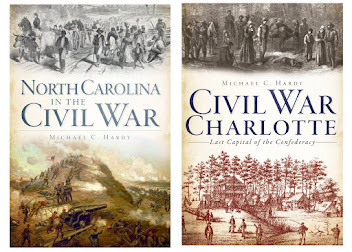 Howard will highlight his investigations and share stories he has discovered during History à la Carte: Recounting Civil War Sacrifices on Wednesday, July 27, at 12:10 p.m. at the N.C. Museum of History in Raleigh . He will explain how he researches the topic and will discuss some of the soldiers’ unusual experiences. Admission is free. Bring your lunch; beverages are free. Howard has painstakingly examined not only official military records, but records from hospitals, cemeteries, churches, prisoner-of-war camps, pensions and more. He has combed through archival and newspaper accounts, diaries, census data and other sources to try to determine military deaths among North Carolina Confederate and Union units. Howard notes that traditional accounts of Tar Heel deaths did not include the approximately 2,000 African American and white North Carolinians who died serving in the Union army. Drop by the Museum of History and hear more during this informative lunchtime lecture on July 27. For more information call 919-807-7900 or go to ncmuseumofhistory.org or Facebook. The museum is located at 5 E. Edenton Street , across from the State Capitol. Parking is available in the lot across Wilmington Street . Museum hours are Monday through Saturday, 9 a.m. to 5 p.m., and Sunday, noon to 5 p.m. The Museum of History , within the Division of State History Museums, is part of the N.C. Department of Cultural Resources, the state agency with the mission to enrich lives and communities, and the vision to harness the state’s cultural resources to build North Carolina ’s social, cultural and economic future. Information is available 24/7 at http://www.ncculture.com/. What is a Confederate Monument? At the North Carolina Civil War Symposium in Raleigh a couple of weeks ago, someone brought up a really good question – what is a Confederate Monument? Of course, the answer to part of this question is easy: the monuments on the grounds of various courthouse or in various cemeteries across our fair state are for certain Confederate Monuments Who can look at the monument on the statehouse grounds in Raleigh, or the courthouse grounds in Burke, and say that these are not Confederate monuments? Personally, my definition would be this: a monument, or plaque, erected by the veterans themselves, or by an auxiliary group, like a Ladies Memorial Association, United Daughters of the Confederacy chapter, of Sons of Confederate Veterans camp, that denote some event, or a group of people, that played a part in the Civil War. However, there are some monuments across the state that do not easily fit into this definition. Take for instance the monuments to Zebulon Baird Vance. There are three that I count: the obelisk at Pack Square in Asheville; the monument on the grounds of the state capital in Raleigh; and, the monument in Statuary Hall in Washington, D. C. Of course, Vance is one of our most famous Confederates, serving as colonel of the 26th North Carolina Troops, and governor from 1862-1865. But Vance’s history goes further. He was elected a Congressman prior to the war, as governor after the war, and finally to the United States Senate. Vance’s monument in Asheville was erected by the Vance Memorial Association, which might have been composed of veterans, but was not a veterans organization per se. Of course, when it came time for the dedication, Vance’s role in the war was prominent in the speech. The Veterans themselves, both blue and gray, marched in the parade, and each year since, the local UDC Chapter, along with B’nai B’rith, placed a wreath on the monument on May 10, Confederate Memorial Day. Even one of the local newspapers, the Mountain Express, considered in 2003 the Vance memorial “a shrine to the Civil War-era governor…” While it has been a while since I’ve been in Pack Square (maybe a decade), I don’t recall anything that actually speaks about Vance’s service ( please correct me if I am wrong). How about Vance’s statue at the US Capital in Washington, D.C.? Is that a Confederate monument? Nothing on it denotes his service to the Confederacy. Yet, Vance is one of our most famous Confederates, and has more written about him than any other war-time Southern governor. There are others. In Charlotte, there used to be a monumental arch marking the birthplace of Mrs. Stonewall Jackson. The monument was erected by the Stonewall Jackson Chapter of the United Daughters of the Confederacy in October 1915. This monument was later torn down. How about the monument that the UDC erected in 1926 in Concord to the KKK? The inscription read: “In Commemoration of the ‘Ku Klux Klan’ during the Reconstruction period following the ‘War Between the States’ this marker is placed on their assembly grounds. The original Banner (as above) was made in Cabarrus County.” (I do not know if this monument still exists.) Is this a Confederate monument? Or, are the dozen or so markers that mark the Dixie Highway and the Jefferson Davis Highway, Confederate markers? If you ask the people in Marshall in Madison County if they have a Confederate Monument, they would probably say yes. There, on the walkway to the courthouse is a rock with a plaque with Robert E. Lee sitting on it. Yet this “monument” marks a road, not local Confederate soldiers or even the famed Confederate leader. In the end, I do believe that the Vance Statues and Monuments are Confederate monuments, but not the Arch to Mrs. Jackson or the KKK marker in Cabarrus County. I’m still mulling over the highway markers. RALEIGH – Destruction was felt around homes and communities as backyards were turned into battlefields in North Carolina during the Civil War (1861-1865). Widespread suffering impacted all North Carolinians regardless of race, class and gender. The involvement of Confederate soldiers, African Americans and women is depicted in the Freedom, Sacrifice, Memory: Civil War Sesquicentennial Photography Exhibit (www.nccivilwar150.com), which will visit the Public Library of Johnston County and Smithfield June 1-29 and the Rowan Public Library in Salisbury June 2-29. The exhibit will honor North Carolinians and their dedication throughout the Civil War with images gathered from the State Archives (www.archives.ncdcr.gov), the N.C. Museum of History (www.ncmuseumofhistory.org), and State Historic Sites (www.nchistoricsites.org). A total of 24 images is being displayed by the N.C. Department of Cultural Resources (www.ncculture.com) in 50 libraries and four museums throughout the state on eastern and western routes from April 2011 through May 2013. A notebook will accompany the exhibit with further info rmation and also seeking viewer comments. The collection depicts those involved in the war including images of artifacts and official documents. Amy Harper of Johnston County is one woman highlighted in the exhibit who exemplifies the sacrifice of women and families. The home of Amy Harper served as a field hospital during the Battle of Bentonville March 19-21, 1865; today the Harper House still stands and can be visited at the Bentonville Battlefield State Historic Site. Many of the images depict artifacts that help to illustrate the individuals of the time period. One illustrates a slave shoe which exemplifies craftsmanship and footwear of the Civil War era. Similar to a military “ Jefferson ” bootee, the homemade leather shoe is attached by iron nails and outlined with bradded metal horseshoes. The wooden sole is hand carved and contoured, and attached with a leather strap. The slave shoe currently belongs in a collection of the North Carolina Museum of History. For info rmation on the exhibit, call the Public Library of Johnston County/Smithfield at (919) 934-8146 or the Rowan Public Library at (704) 216-8228. For tour info rmation, contact the Department of Cultural Resources at (919) 807-7389. RALEIGH - The State Capitol will mark the 150th anniversary of the Battle of Big Bethel on Saturday, June 11. The battle took place in June 1861 in Virginia . Henry Lawson Wyatt, honored with a statue on the Capitol grounds, died at Big Bethel, and was the first North Carolina soldier to die in battle for the Confederate cause. From 10 a.m. until 3 p.m., the North State Rifles re-enacting group (www.northstaterifles.com) will be on the northwest Capitol grounds at the Wyatt monument. Group members will speak about Wyatt’s life, model the variety of uniforms worn by Tar Heels in the first year of the war, and give a lecture on the Battle of Big Bethel. Displays at “Remembering Big Bethel” will shed light on how soldiers made the transition from home to the battlefield. For generations, it was held that Wyatt had the grim distinction of being the first Confederate killed in battle. This became a point of pride for many in North Carolina , and on the 51st anniversary of his death the United Daughters of the Confederacy erected a monument to him on Union Square with an inscription that read “First Confederate Soldier to Fall in Battle in the War Between the States.” In truth, Captain John Q. Marr of Virginia was fatally shot in a skirmish ten days before the Battle of Big Bethel. Capitol staff will be on hand to assist visitors in making a stone rubbing of the base of the Wyatt monument to take home as a remembrance. Additionally, a new exhibit titled “The Capitol: 1861” will be on display inside. The event is free and open to the public. The program is part of the N.C. Department of Cultural Resources’ 2nd Saturdays (www.ncculture.com) summer programming series which showcases North Carolina ’s culture, heritage and arts. Partners in 2nd Saturdays include “Our State” magazine and AT&T. Media sponsorship is provided by Public Radio East. For a complete schedule of more than 100 2nd Saturdays programs across North Carolina , go to www.ncculture.com or call (919) 807-7385. The State Capitol’s mission is to preserve and interpret the history, architecture and functions of the 1840 building and Union Square . The Capitol is at One Edenton Street , Raleigh , N.C. 27601 . Visit www.nchistoricsites.org/capitol/default.htm or call (919) 733-4994 for more info rmation on the state historic site. Administered by the Division of State Historic Sites, the State Capitol is part of the N.C. Department of Cultural Resources, the state agency with the mission to enrich lives and communities, and the vision to harness the state’s cultural resources to build North Carolina ’s social, cultural and economic future. I believe that I have sufficiently recovered from my weekend ramble to fill you in on a few of the highlights. We spent Friday afternoon at the South Mountain Battlefield, exploring the positions of the Tar Heel regiments. I will confess that this was my first trip to the area. Much of my battlefield tramping is connected with whatever regiment I happen to be working on at the time. This was no exception, as one of the Tar Heel regiments involved in the battle might be my next project. We also got to view the North Carolina Monument at South Mountain, which ranks up there with the best Tar Heel Confederate monuments. Having finished our work at South Mountain, we drove over to Antietam for a few minutes, hiking along the Sunken Road. On Saturday, we toured portions of the battlefield, including the customary drive down Confederate Avenue. I spent more time exploring the right of the Confederate army for an upcoming article, and we spent more time at the Devil’s Den, possibly one of my favorite sites on the battlefield. Saturday afternoon was spent in town, book shopping. 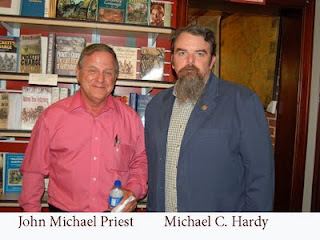 Saturday evening I was signing books at the American History Store with John Michael Priest. Sunday found us on the field at Gettysburg again. I was hoping for some good photo ops, but the clouds were thick. Kind of hard to photograph a gray monument with a gray background! We did drive around the east Cavalry Battlefield. On Sunday afternoon, we traversed the Monocacy Battlefield, near Frederick, Maryland. This was my first time visiting this field, and we got in some great hiking in 90+ degrees . Greatly enjoyed the witness trees along the trail at the mill pond. It appears that none of the positions occupied by the numerous Tar Heel regiments are preserved. It was nice meeting Brent Spaulding at the Monocacy Park and getting a signed copy of his new book on Early’s 1864 Maryland Invasion. Overall, it was a great trip – my mom and dad came up and watched the kids and Elizabeth and I had some time away. I also picked up some more books and made some great connections! 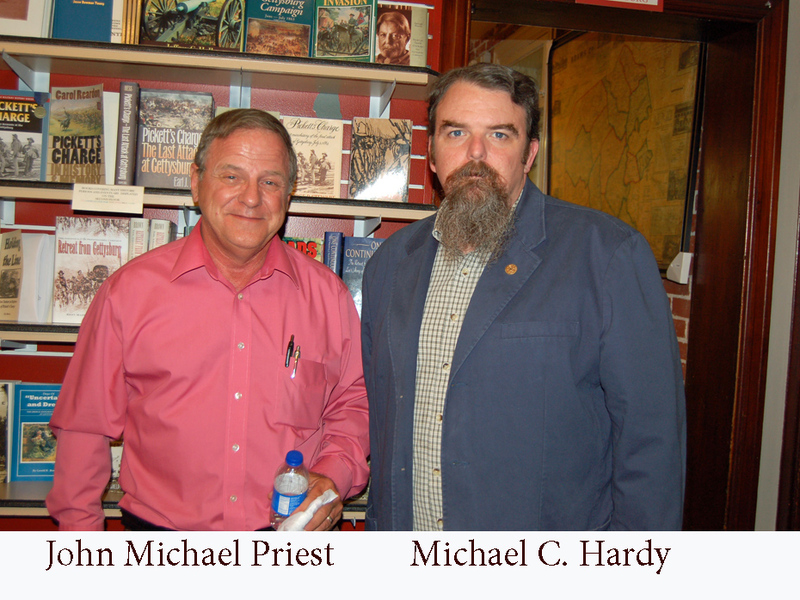 A special word of thanks to James Glessner of the American History Store and co-owner of Ten Roads Publishing for putting together the signings on both Friday and Saturday evenings!